HubSpot deduplicates your records in a few different ways to keep your database clean. Contact and companies can both be deduplicated based on specific property values. Contacts may also be deduplicated by a usertoken set with a cookie in their web browser or by email address. Contacts, companies, deals, and tickets can all deduplicated by a unique object ID included in an export of these records. When a new contact is added to HubSpot through a form submission, HubSpot first looks at a contact's usertoken to see if it should be merged with an existing contact. The usertoken is the hubspotutk cookie that HubSpot stores in a visitor's browser when they view a page that includes your HubSpot tracking code. If a visitor submits a form on one web browser, then another visitor submits a form using the same browser on the same computer, these contacts will be merged together. The information from the second form submission will overwrite the information from the first submission because they have the same cookie stored in their browser. This will happen only if the email address from the second submission doesn't already exist as a contact in HubSpot. You can disable cookie tracking on your form if you want each form submission from the same browser to create a new contact. This can be useful in specific use cases, such as collecting contact details at a trade show on a single device. When a new contact is added through import, form submission, or API, HubSpot will look for a matching value in the Email property. If a contact exists with the same email address as the one being added, the new contact information will be added to the existing contact record. For example, if you import a list of contacts that includes any email addresses already associated with existing contacts in HubSpot, the imported information will be added to the existing contact record. When a new company is added through import, HubSpot looks at the Company domain name property value to deduplicate companies. If a company with the same company domain name already exists in your account, the new company information will be added to the existing company record. If you do not include this property in your import, each row of your import file will be imported as a new company record. Please note: companies added through API will not be deduplicated by the Company domain name property. When a new contact, company, deal, ticket, or product is added through import, you can use a unique object ID to match up these records with existing records in HubSpot. This object ID can be used to deduplicate records during the import process, or to search for a specific record in HubSpot. To get the Contact ID, Company ID, Deal ID, Ticket ID, or Product ID, you must first export your records. When you receive your export file, the corresponding record ID will be listed in column 1. Include the Contact ID, Company ID, Deal ID, Ticket ID, or Product ID column in your file when you import your records into HubSpot. 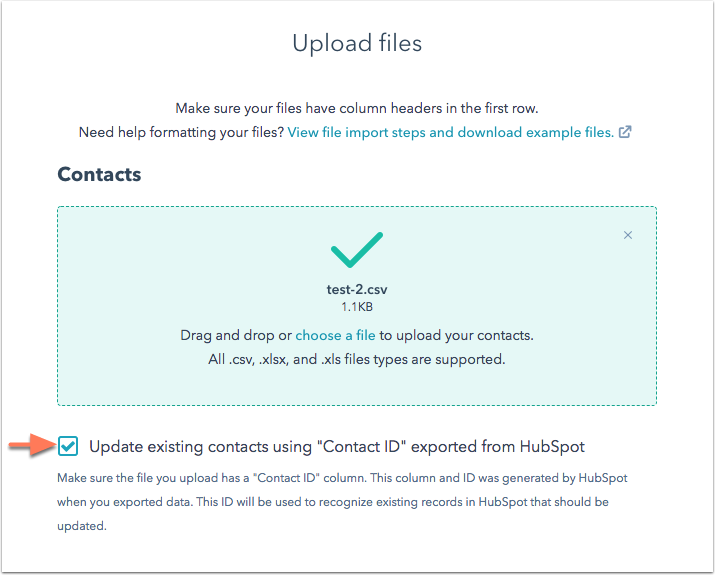 During the import process, you'll click the Update existing [records] using "object ID" exported from HubSpot checkbox when you choose your file. 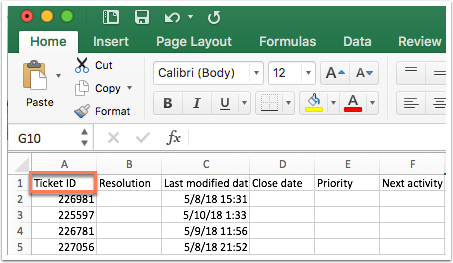 Please note: if you include the object ID column in your file, any rows that do not have a value for the record ID will be skipped during the import process. Contacts imported with the Contact ID won't update the Email property. Companies imported with the Company ID won't update the Company domain name property.